When NUUO software encounters a critical error (like crashes, hangs, freezes, etc.) and TeamViewer session is not available, users can collect full dump files for troubleshooting. Full dump files contain necessary information to solve the encountered problems. Kindly send full dump files to eHelpdesk. 2. Run "Debug Diagnostic Tool". 3. Duplicate any critical error happened on your system. Once an error pops up, go to the next step. 4. 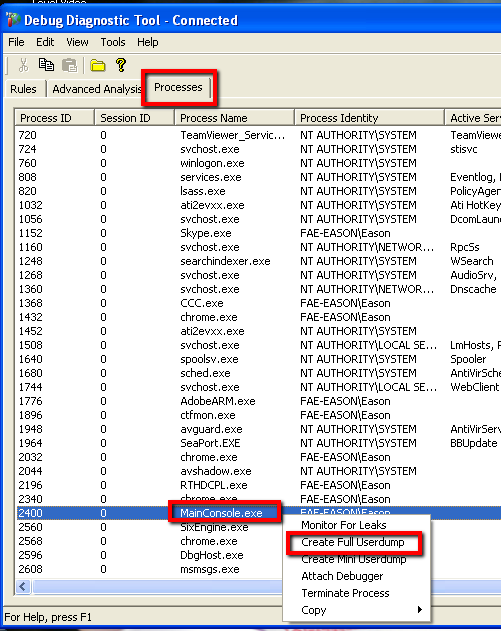 Go to "Processes" tab and find "Mainconsole.exe". Then with your mouse right-click on "Create Full Userdump". How to collect dump files and system infomation for troubleshooting? [Mainconsole] Where can I find out the dump file?